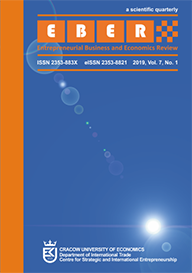 Objective: The purpose of this article is to verify the relation between the value of high‐tech export and the value of intellectual capital assets. Research Design & Methods: At the first stage of the study, an analysis of the value and structure of high‐tech export in the V4 countries was performed. At the second stage, the Synthetic Intellectual Capital Asset Index (ICA) was calculated using the Perkal index. At the last stage, in order to examine the relation between the value of high‐tech export and the value of intellectual capital assets, an estimation of panel models for selected variables was performed. Findings: The results of analysis show that the value of high‐tech export from the V4 countries varies, and the V4 countries score lower in the ranking of EU countries arranged by the value of ICA is than in the ranking of EU countries arranged by the value of high‐tech export. Implications & Recommendations: The relation between the value of high‐tech export and the value of ICA was negative for the V4 countries, but models created with the data for all EU countries showed a positive correlation. Identify the causes of such a situation could be very valuable. Contribution & Value Added: Linking intellectual capital assets to the high‐tech export could be helpful to find the sources of the high level of exports in this sector. Agarwal, S. & Ramaswami, S.N., 1992, ‘Choice of foreign market entry mode: Impact of ownership, location and internalization factors’, Journal of International Business Studies, vol. 23, no. 1, pp. 1‐27. Andersen, O., 1993, ‘On the internationalization process of firms. A critical analysis’, Journal of International Business Studies, vol. 24, no. 2, pp. 209‐231. Alcaniza, L., Gomez‐Bezaresa, F. & Roslenderb, R., 2011, ‘Theoretical perspectives on intellectual capital: A backward look and a proposal for going forward’, Accounting Forum, no. 35, pp. 104–117. Andriessen, D. & Stam, C., 2005, Intellectual Capital of the European Union, Paper for the 7th McMaster World Congress on the Management of Intellectual Capital and Innovation, January 19‐21, 2005, Hamilton, Ontario, Canada. Batagi, B.H., 2005, Econometric Analysis of Panel Data, Chichester: John Wiley & Sons Ltd.
Bontis, N., 2001, ‘Assessing knowledge assets: a review of the models used to measure intellectual capital’, International Journal of Management Reviews, vol. 3, no. 1, pp. 41‐60. Bontis, N., 2002, National Intellectual Capital Index: Intellectual Capital Development in the Arab Region, IICR and UNDP, Version January 10, 2002. Bontis, N., 2004, ‘National Intellectual Capital Index. The Benchmarking of Arab Countries’, Journal of Intellectual Capital, vol. 5, no. 1. Chen, D.H. & Dahlman, C.J., 2005, ‘The Knowledge Economy, the KAM Methodology and World Bank Operations’, World Bank Institute Working Paper, no. 37256, Washington, DC. Edvinsson, L. & Malone, M., 1997, Intellectual Capital: Realizing Your Company's True Value by Finding Its Hidden Brainpower, New York, NY: Harper Business. Journal of Human Resource Costing & Accounting, vol. 4, no. 1, pp. 21‐33. Edvinsson, L. & Lin, C.Y., 2011, National Intellectual Capital A Comparison of 40 Countries, London: Springer. Eurostat Database <http://epp.eurostat.ec.europa.eu/portal/page/portal/statistics/search_data base> [4 December 2013]. Hatzichronoglou, T., 1997, Revision of the high‐technology sector and product classification, Organization for Economic Co‐operation and Development, OCDE/GD(97)216, Paris. Hudson, W.J., 1993, Intellectual Capital: How to Build It, Enhance It, Use It, John Wiley, New York. Juchniewicz, M. & Tomczyk, U., 2013, ‘Kapitał intelektualny sektora przedsiębiorstw na tle produktu krajowego brutto według województw’, Wiadomości Statystyczne, no. 4, pp. 47‐ 59. Kronfeld, M. & Rock, A., 1958, ‘Some Considerations of the Infinite’, The Analyst’s Journal, November, pp. 87‐90. Malina, A., 2004, Wielowymiarowa analiza przestrzennego zróżnicowania struktury gospodarki Polski według województw, Kraków: Wydawnictwo Akademii Ekonomicznej w Krakowie. Nič, M. & Świeboda, P. (eds. ), 2014, Central Europe fit for the future. Visegrad Group ten years after EU accession, Bratislava and Warsaw: CEPI – DEMOS. Nowakowska, A., Przygodzki, Z. & Sokołowicz, M., 2011, Region w gospodarce opartej na wiedzy. Kapitał ludzki, innowacje, korporacje transnarodowe, Warszawa: Difin. OECD, 1996, The Knowledge‐based Economy, Organization for Economic Co‐operation and Development, OCDE/GD(96)102, Paris. Wach, K., 2012, Europeizacja małych i średnich przedsiębiorstw: rozwój przez umiędzynarodowienie, Warszawa: Wydawnictwo Naukowe PWN. Weresa, M.A., 2002, Wpływ handlu zagranicznego i inwestycji bezpośrednich na innowacyjność polskiej gospodarki, Warszawa: Oficyna Wydawnicza Szkoły Głównej Handlowej. Weresa, M.A., 2012, Systemy innowacyjne we współczesnej gospodarce światowej, Warszawa: Wydawnictwo Naukowe PWN. World Bank Database <http://databank.worldbank.org/data/views/variableSelection/selectvariables.aspx?source=world‐development‐indicators> (4 December 2013).